Home › Inspirational › Happy Holidays Everyone! As the year 2012 comes to a close, I can’t help but reflect over the time I’ve spent this year working hard to present a platform of peace for the human race. Despite the challenges we’ve faced this year, I hope that you all spend this Holiday Season remembering the good in the world, the people who’ve reached out a helping hand to those who’ve lost something or someone, the unsung heroes, the angels among us, your neighbor, your friends, your family. This is a time when we should all reflect on what we have, and keep close to us those we love and who love us. 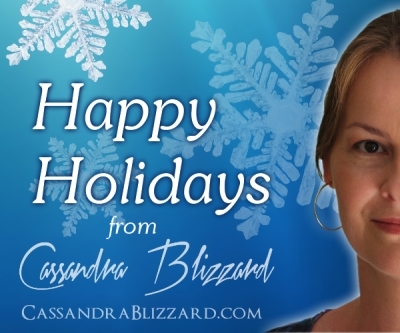 I’m wishing all of you a beautiful holiday season, love and comfort for all, and a joyous new year. Never give up on hope, and never give up believing in your soul and what you can accomplish through the love, guidance, and wisdom of your soul. As this year comes to a close and a new one begins, I will be finishing up some long overdue projects. And you never know…I may be appearing soon in a city near you, bringing my message of hope and love. In the meantime, be at peace within yourself and keep reaching for the stars. Sometimes those stars drift down to touch our fingertips and remind us what we are made of and where we come from.